Architectural tables are a necessity for anyone sketching on a large sheet of paper to create a diagram or blueprint. Also known as a multipurpose desk or drafting board, there are hundreds of designs to choose from to complement an office’s décor. 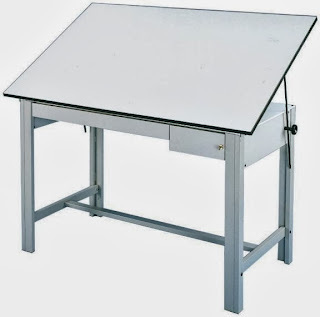 Primarily used by professional architects or students studying architecture, drafting tables are also used by artists working on enormous pieces of canvas, vellum or poster board. An individual working on a sheet of paper on a drafting board’s surface may want to sit on a chair or tall stool while other individuals prefer to stand. Before ordering one of these specialized desks, it is important to consider a variety of factors, including the size of the room and financial budget. An important aspect of drafting desks is the tabletop construction that has a raised edge to assist with holding paper in place. As someone working on one of these tables moves or slants its top, the paper should remain in place due to the specially designed edge. In addition, most of these tables are designed to hold clips along the other edges to keep paper or poster board firmly in place. Modern architects and artists also are able to clip equipment such as lamps and measuring devices to the edges of the desks. To protect wood or plastic tabletops, manufacturers suggest that a desk owner place a vinyl cover on the device to prevent marks from pencils and pens. Architectural tables are designed to tilt at various angles that are comfortable for painters or drafters. When someone needs to order multipurpose desks for an office or school rather than a home, it is a good idea to choose a model that is easy to adjust quickly. Students needing to carry a drafting desk to a classroom or someone living in a small apartment should select portable or foldable designs. A drafting board may also have built-in storage with drawers in the middle or on one side to hold measuring devices or writing tools.